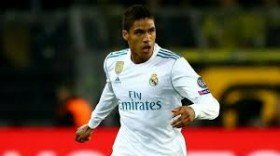 Real Madrid defender Raphael Varane is reportedly said to have snubbed advances from Manchester United in order to pursue a move to Juventus in the summer. The France international has been a regular figure at the heart of the club's defence in the past eight years, but he is keen on a fresh challenge at the end of the campaign. Bayern Munich, Paris Saint-Germain and United are all understood to hold an interest in pursuing his services, but according to The Mirror, the Bianconeri remain his prime destination for the summer. Despite this, Los Blancos manager Zinedine Zidane has continued to dismiss the speculation and he recently stressed that the 2018 World Cup winner will remain at the club for many years to come. Varane has won two La Liga titles, four Champions League crowns and one Copa del Rey since joining Los Blancos from French minnows Lens eight years ago. He has bagged 55 caps for France in this period.